Vincent D’Onofrio’s somewhat sympathetic baddie Wilson Fisk was one of the highlights of season one of Daredevil, Netflix’s first installment of its Marvel TV universe. 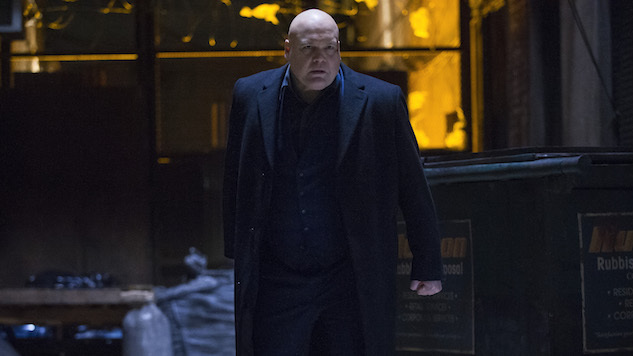 After Fisk had a brief but memorable part in season two, Deadline now confirms that D’Onofrio will return in season three. The official Daredevil Twitter account also celebrated the news, with a .GIF captioned, “He rises,” even though D’Onofrio stays sitting down. But Deadline also mentions a creative shakeup behind the scenes of the Charlie Cox-starring superhero show, with the announcement of a new showrunner. Marvel TV chief and executive producer Jeph Loeb casually mentions in a statement that Erik Oleson, an executive producer and writer on Amazon’s The Man in the High Castle, will lead the writers’ room. Oleson has the superhero credentials as well, having spent some time as a co-executive producer on the CW/DC show Arrow. For those of you who aren’t keeping count, Oleson is the fifth person to act as a showrunner for Daredevil. The series was initially developed by Drew Goddard (The Cabin in the Woods) before he left to helm Sony’s eventually aborted Sinister Six movie (Goddard stayed on as an executive producer for Daredevil and The Defenders). Steven S. DeKnight (Spartacus) took over for season one, leaving afterwards to take part in the Transformers franchise and directing Pacific Rim Uprising. Daredevil writers Douglas Petrie and Marco Ramirez co-ran season two, and then helmed The Defenders (Petrie left the project before filming began). For unknown reasons, Ramirez is not attached to season three. And we thought The Walking Dead had problems with showrunner retention. Marvel confirms that season three of Daredevil will stream on Netflix in 2018, but expect the second seasons of Jessica Jones and Luke Cage before that. Meanwhile, the next Netflix-Marvel show up to bat is The Punisher, out on Nov. 17. Watch a trailer for that series here.